The G10LM is the latest G10 model and is a slightly smaller more compact version of the MWC G10 100m. The G10LM replaces several variants of the MWC G10A and although it is identical in size and appearance to the G10A it has a date window, solid stainless steel case, 50m (165ft) water resistance, screw caseback. 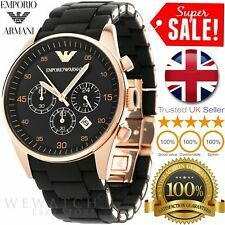 Armani AR5860 Chrono Wristwatch. Stainless Steel Wristwatch. £150 IN THE HIGH ST JEWELLERS. See our other item s.
MPN HB1513440. This very cool and trendy watch could be an addition to your collection. 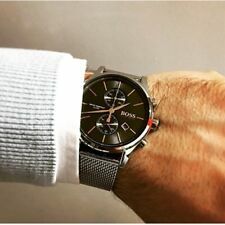 There are all kinds of watches with a trendy look, but also a classic one. Dial Colour Grey. Case Material Stainless Steel. MPN HB1512567. Other features include chronograph, date function and the piece fastens with a black leather strap. Strap type Leather Strap. Strap Colour Black. Apple's Steve Jobs and his British designer, Sir Jonathan I've saw the world stop with their jaw dropping launch of the iPad in 2010. Stowa Flieger Classic 40. Watch only, without box or papers. (the watch pillow and cloth in pictures are not included). Great condition. There is a very small mark on the crystal around "5", but it's so fine that it won't show in pictures. MANS ACCURIST SKYMASTER. IN GREAT CONDITION NO SCRATCHES TO FACE OR BACK. WORN TWICE. STILL HAS STICKY ON THE BACK. Hugo Boss Supernova 1513358 is an amazing and special Gents watch from Supernova collection. Case is made out of Rose Gold Ion-plated Steel while the dial colour is Black. Chronograph: Yes. Strap colour: Two tone. Model: AR2448. We love the simple look of this bracelet watch. Case: Stainless Steel. Strap: Stainless Steel. Warranty: 2 Years International. Skagen Men's SKW6216 Hagen Quartz Analogue Wrist Watch Brown Leather Strap. 5 out of 5 stars - Skagen Men's SKW6216 Hagen Quartz Analogue Wrist Watch Brown Leather Strap. 2 product ratings2 product ratings - Skagen Men's SKW6216 Hagen Quartz Analogue Wrist Watch Brown Leather Strap. Lorus Men's Blue Dial Brown Strap Chronograph Watch. 4.5 out of 5 stars - Lorus Men's Blue Dial Brown Strap Chronograph Watch. 2 product ratings2 product ratings - Lorus Men's Blue Dial Brown Strap Chronograph Watch. Dial Colour: Black. Case depth approx. : 12mm. Case Material: Ceramic. Case Shape: Round. Case width approx. : 47mm. More Products. Get Social. Clasp type: Butterfly. Model : AR5860. Features : 12-hour Dial, 24-hour Dial, Chronograph. Dial Window: Material Type Mineral. Case Material: Stainless steel. Band Material: Stainless Steel. Mineral Crystal. Model: AR2448. 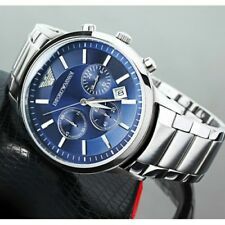 Are you looking for amazing watches?. 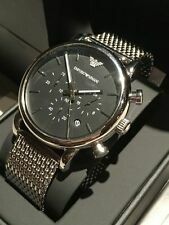 Emporio Armani AR2448. Grab this item now ! The item is limited ! Round stainless steel case (diam. We will replace or repair any faults that may arise within the 2 year warranty period. ). 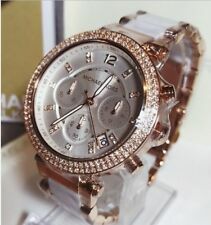 Michael Kors Camille Jellow Gold &Silver Tone Ladies Watch MK 5653. Used exelent condition, in full working order, visible normal wear and tear, face without any scratches, sold with orginal box, booklet and spare links, any qestions please ask, read the shipping information carefully I do not send parcel oudside the UK Dispatched with Royal Mail 2nd Class. It is also water resistant up to 5ATM. Emporio Armani. Stainless steel. Watch Face Colour. Watch Finish. Watch type. Face Shape. Case width: 41mm. Great chunky and very heavy Sekonda ONE 3796 chronograph gent'swatch with a brushed stainless steel case, brushed stainless steel bracelet link strap (currently set up to fit a wrist size 7.5" or 19cm but can be made larger via an adjustable clasp) with a striking grey multi-dial face. MODEL NUMBER: AK001. STRAP MATERIAL: HIGHLY DURABLE NYLON RIP-TAPE FASTENING/ VELCRO STRAP. STRAP COLOUR: BLUE / TURQUOISE FLORAL PATTERN. FLEXIBLE LENGTH WITH RIP-TAPE/ VELCRO FASTENING. CASE COLOUR: SILVER WITH ROTATING BEZEL.